The Project - mohnblumen-auf-koenigsplatzs Webseite! November 11th, 2018, will see the centenary of the Compiègne Armistice and thus mark one hundred years since the end of World War One. 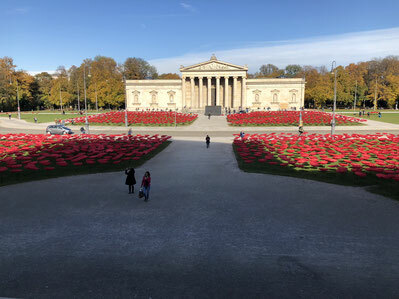 For this occasion, the Munich performance artist Walter Kuhn will transform Königsplatz into a sea of 3000 large red silk poppies. With the poppy flower being the international symbol of Rememberance, particularly. In English-speaking countries, this installation is dedicated to the millions of military and civilians victims of all wars. 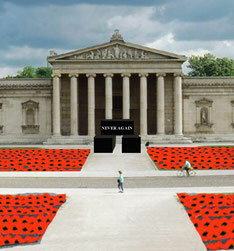 As an artistic contrast to the large area dominated by the red poppies, a hollowstructure consisting of several large containers, cladded in black, will be erected on the semicircle in front of the Glyptothek. On this structure’s exterior walls the appeal "NIE WIEDER", „NEVER AGAIN“, PLUS JAMAIS" or "никогда" will be installed in large letters – the different languages representing the parties involved in World War One. dead and fallen of both World Wars. As pioneer plants, field poppies were often the first plants to grow on the soldiers‘ fresh grave mounds. 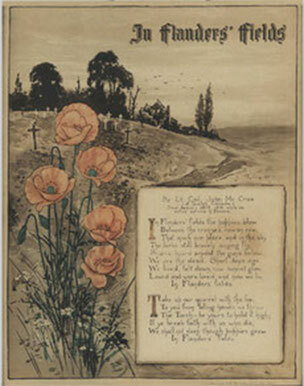 This symbolism has been promoted in particular by the famous 1915 poem „In Flanders Fields“ by John McCrae (even though the detailed lyrics should be appreciated in the context of their time of writing. The sea of red poppies swaying in the wind during the often gray days of the month of rememberance is intended not only as a work of art, but also as a nod to the centenary of the end of World War I; to remember all the grief and sorrow it brought, and to serve as a reminder of the importance of peace. While the city of Munich is rightly associated with many positive images, it is also still burdened by its role as former „Hauptstadt der Bewegung“ („Capital of the Movement“)during the Nazi Reign. At this time, Königsplatz, designed in the 19th century by Karl von Fischer and Leo von Klenze as a „royal square“ („königlicher Platz“), was transformed. 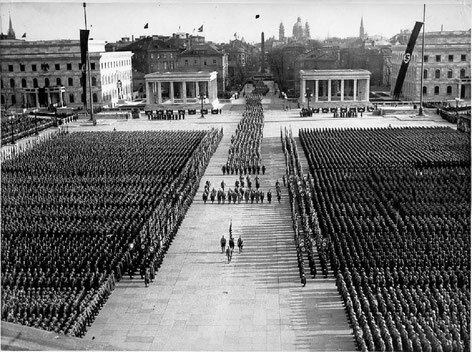 The lawn area was paved over with large granite slabs, and Königsplatz was consequently used by the Nazis as a parade ground for elaborate displays of power, involving thousands of troops. 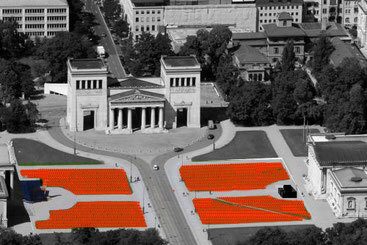 It is in this historical context that Königsplatz seems particularly suited as a location for a Rememberance of all fallen soldiers- where the soldiers themselves once marched, they are now being symbolically replaced by large poppy flowers. On the one hand, the project on Königsplatz is meant to be aesthetically spectacular, comparable, say, to the Christos` famous installations (e.g. the covering of the Reichstag Building in Berlin). On the other hand, it is intended as a silent protest against the ongoing noisy memorial services initiated by right-wing associations. Especially in times of increasing global rearmament and a resurgence of revanchist ideologies (going as far as Nazi-sympathising tendencies within the Bundeswehr) a clearly focussed aesthetic intervention appears to be essential. With this project, Munich can take a stance.